Eating at Bobby’s Burger Palace!!! After getting off the plane in Las Vegas to celebrate my lifelong friend, Erik’s, 40th birthday, I was feeling hangry. I wanted something with substance. I wanted a burger. 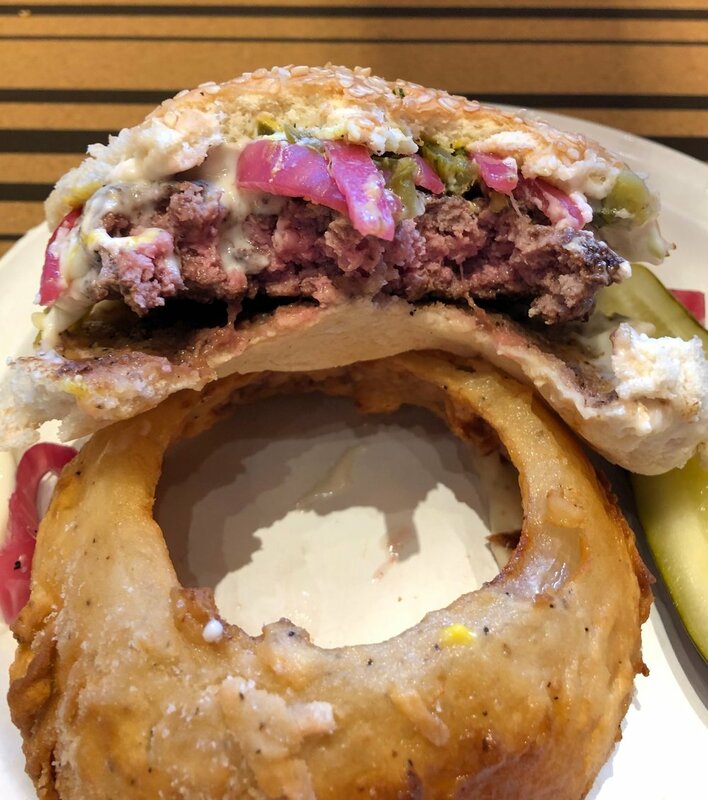 A quick check on Yelp led me to Bobby’s Burger Palace. The Bobby referenced is Bobby Flay so it better be good. While looking at the menu, the Green Chili Cheeseburger caught my eye. I’m a sucker for green chili’s. 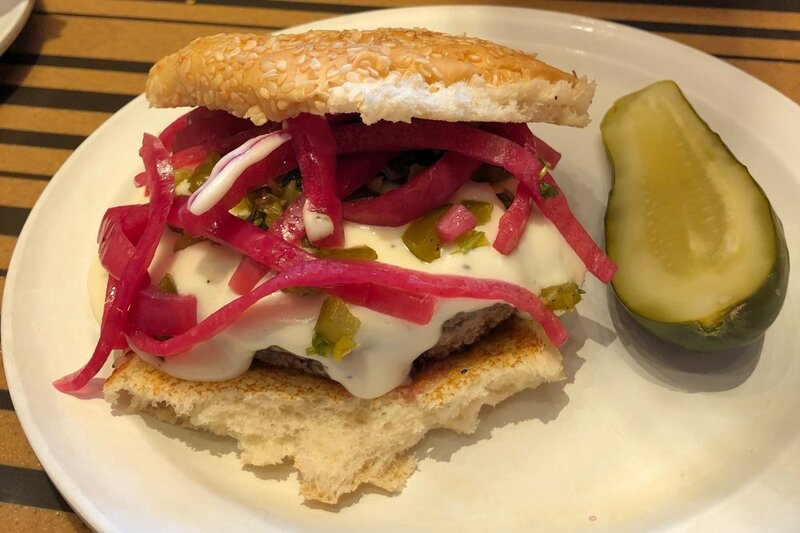 It consists of a cooked to order, all beef patty on a house made bun with white queso, green chili’s and pickled red onions. I couldn’t decide on what side to get and should’t you know it, the have something called the undecided. You get to choose 2 of there sides which are fresh cut fries, sweet potato fries and onion rings. I opted for the onion rings and fries. Lets talk about the star of the show, the burger. I quite enjoyed it. The beef was cooked to a perfect medium and the bun, while thin and squished looking, was the perfect density to hold the burger together. The queso was great and the picked red onions gave it a nice texture and some acid to cut through the rich beef and queso. To be honest, the green chili’s got lost in the mix. They just didn’t pack the flavor I am use to. Not bad by any means, just overly muted. The fries and onion rings were on point. Fresh cut fries can be hard to do and these guys nailed it. Very crispy and well seasoned. My only complaint about the onion rings, is how they are cut. While the thick cut rings look great, they are damn hard to eat! It’s ok, I’ll live. They were delicious! The subtle sweetness of the onion with the buttermilk batter are flavors made for each other. All in all, this was the meal this tired traveler needed. Would I eat here again? You bet! Would I recommend it to others? Affirmative. If you happen to see a Bobby’s Burger Palace on your travels, stop on in. Tell them Doug sent ya. They don’t know who I am so it will be really awkward. 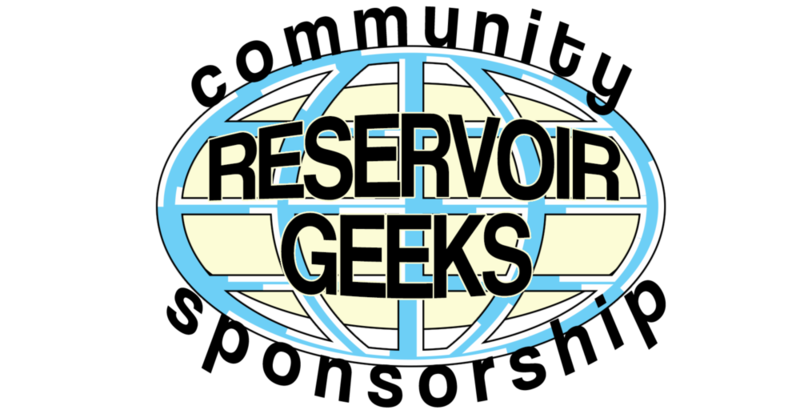 Posted on January 17, 2019 by Doug Bashore and filed under Reservoir Trips and tagged travel burger vegas hamburger.